I know I took the secret oath to never reveal the truth about what it’s really like to be a published author, but I’ve decided I can’t, in good conscience, keep quiet any longer. If you’d rather keep your dreams of authordom intact and unsullied, stop reading NOW. You are going to eat a lot of cookies. There is a cosmic law that requires bookstores and libraries to offer this sustenance to authors and their readers. The more people who attend these events, the less you (the author) will have to consume, so be sure to invite every cookie eater you know to your book events. Otherwise, you will have to eat all the cookies yourself so your host won’t feel bad, and then your clothes won’t fit, and you’ll have to buy a new wardrobe (see #6 below). 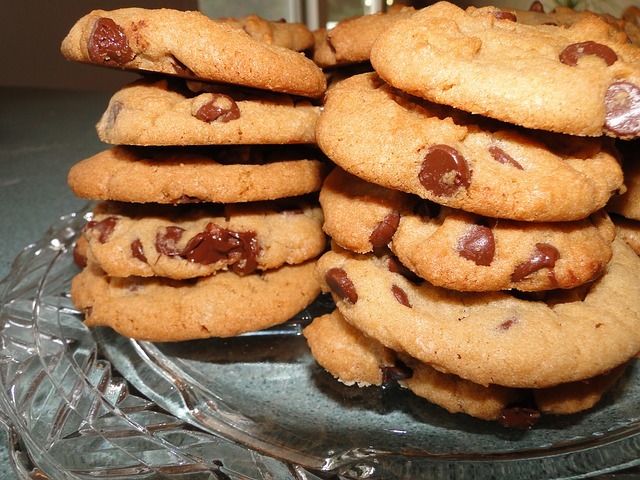 If you want to buy a new wardrobe anyway, go ahead and eat all the cookies. It will make your book hosts happy because they don’t want to eat the leftovers. You are going to bond with your car since you’re going to be putting on the miles as you drive from one book event to another. Tell your friends and family to give you pre-paid gas cards for birthdays and holidays. Keep books in your trunk. Tape pictures of your loved ones onto the dash so you can remember what they look like. Do NOT eat cookies in the car, even if you are starving between book events, because it’s virtually impossible to get all the crumbs out of your car. You will somehow, miraculously, find time to work everything in to promote your published book. You will not, however, find time to write your next book. You have to do that instead of sleeping at night. The good news is that the cookies you eat all day promoting your book have enough sugar in them to keep you awake while you write. You will land a short interview on the local TV station – congratulations! You will walk into the green room to wait for your turn and share a couch with a Chihuahua dressed as Marilyn Monroe (complete with blonde wig and iconic white dress) and a pug masquerading as Snow White. You will be humbled to realize that book publication rates right up there with the best Halloween costumes for small dogs. And you will learn that dog biscuits can look a lot like cookies. Your writing income will probably not pay the bills, or at least, not all of your bills. But you’ll eat all the cookies you’ve ever wanted. Now, who wants a cookie? This entry was posted in Writer's Life and tagged encouragement for writers, Jan Dunlap, Writer's Life, writing life by jandunlap. Bookmark the permalink. Speaking of brownies, a friend just gave me the most amazing recipe I’ve ever seen, with caramels and pecans and German chocolate cake mix. I’m baking it today to take with me to a book club talk. I may even forget what my book is about. You’ve made my day, Leslie! My pleasure, Mary! The photo of the cookies is no-cal, too! Awesome post, Jan – you hit the chocolate right on the chip! You forgot to mention that cookies consumed at the keyboard are the gift that keeps on giving as you enjoy picking the crumbs out from between the keys for many moons to come. You are so right, Debora – thanks for adding that astute observation! I’ve switched to ice cream while I write – it’s easier to clean off the keys. I’m already being initiated into the ‘published’ club with the expectations of publishers and those of readers and acquaintances – not to mention family – smashing up against one another. No wonder you are eating cookies! We writers have to find unconditional acceptance somewhere, right? Thanks for joining the conversation, Renee, and good luck with your publication!! Thank you SO much, Jan! What an encouraging post! I LOVE cookies! I CANNOT wait for my first book contract! But I WILL miss the cookies in the “waiting room.” And the coffee’s pretty good, too. Reblogged this on Pen Wizard. Well done!! Whimsical and humorous, but the challenges come through, too. Sure wish I had a cookie right now. Me, too. Thanks for commenting, Sammy. That should be my next post, Heidi! Love that children’s classic. I much enjoyed your post about the reality of being an author. I have not been impressed by the abilities and work ethics of the agents I have met, and had decided to send more work to Amazon. But now — now you tell me about the cookies! It’s like you are psychic and know my great weakness. Now things are complicated again – but I appreciate it. Thanks for stopping by, Wayne. At least in Hawaii, I bet you get warm cookies. I live in Minnesota – booksellers have to warm up our cookies in microwaves! You know it! You’re ready to join the club and take the oath now. You are brilliant as always, my friend. Love this post — and can sadly identify with the cookie consumption analogy.